I didn’t take offense because I know that he wouldn’t last ten days living in a rural area, let alone ten years. My thinking on that matter is that someone up here would sooner or later take actual offense to such a startling observation, and thump him rudely on the head! For some reason it put me in mind of the fairy tale story of the: “Princess and the Pea”. To summarise an already brief fairy tale, a girl turns up at castle requesting that they put her up for the night because of her claims to royal lineage. The people living at the castle were a bit dubious about her claim (as would I) and set a test for her. The test involved placing a pea under something crazy like twenty seven mattresses (I’ll bet they were thin memory foam mattresses! ), and if the girl could feel the pea, well clearly she was of noble birth. The following morning the little ingrate woke up complaining about feeling a lump in the bed – and the residents of the castle quickly moved to tie the Princess down in marriage. That will teach the girl for complaining, but I’d have to suggest that she was already probably quite practiced in that gentle art – good luck to the prince! Why I was reminded of that fairy tale was because it is not only the male of the species that provides unasked for and candid observations. I have heard more than a few females over the years suggest that they could not do some task or other, because they are a princess. It seems like a big call to me, but there you go. There are actually a handful or perhaps many more actual princesses on the planet. The editor was regaling me with a tale earlier this evening that apparently Meghan Markle, Duchess of Sussex can no longer consume pasta. Too bad, so sad for her. And I’d like to mention a personal anecdote at this point in the story, because the editor was in fact enjoying pasta (linguine marinara to be precise) with me, whilst also supping on a dark ale at the charming local pub on Thursday evening just past. Why the heck would anyone want to be a princess and miss out on that gear? Anyway, I reckon all those young ladies that made the preposterous claim to me over the years about being a princess, are basically talking rubbish. And that is because I reckon that if you put a plate of well cooked tasty fresh pasta in front of them, they’d chow down hard on that food. I now rest my case. So, sorry to say, but the editor is no princess, and makes no claim to such high status. Clearly princesses get told what they can and can’t do, and the editor has no truck with such nonsense especially when tasty pasta is involved. And peas, well, even me being a male understands that chucking a pea under so many mattresses is a bit of waste of a pea. And what I wanted to know about the fairy tale was where the heck does anyone obtain twenty seven mattresses merely so as to conduct such a bizarre test, but then I make no claim to high status and these things may be beyond my ken. Back to peas (and nuts). Years ago, the editor and I used to purchase our peanut butter at a local market. I didn’t much like the bloke who ran the stall because he had even more trouble with basic maths than I did, and on several occasions I had to correct his calculations – which oddly always seemed to be in his favour. After a while the editor and I had had enough of dealing with him. We had to find a different supplier though, and I noted that the bread ladies which I bought my bakery supplies from had a commercial peanut butter mill. So we began purchasing freshly ground peanut butter (I’ll bet princesses can’t eat that yummy stuff) from them. The thing was, the bread ladies were just grumpy regardless as to how cheerful, or distant I was. What is with these peanut butter folks? That business closed down. What were we to do? Well, the editor makes no claim to being a princess, and so took charge of the situation and swung into action. It should be remembered that princess generally have a long list of things they can and can’t do, and making their own peanut butter let alone consuming it, would most certainly be on the ‘can’t do’ list. Peanut butter is ridiculously easy to make. The editor puts two cups of dried (non salted) peanuts into a food processor with a very sharp blade implement, and then just presses the ‘go’ button. In a couple of minutes there is fresh peanut butter, with no preservatives, no salt, and no added oil. And on fresh oven baked bread peanut butter is superb. Those princesses sure are missing out of both peanut butter and independence! We continued with the extension of the strawberry terrace. 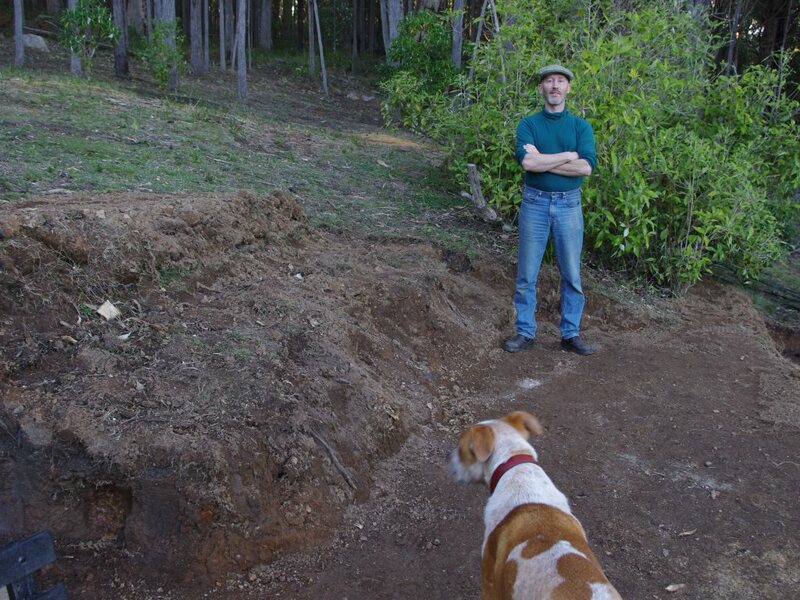 Regular readers will recall that last week, we unearthed a huge old tree stump during the excavations. If the strawberry terrace was to be extended, the huge old tree stump had to go. 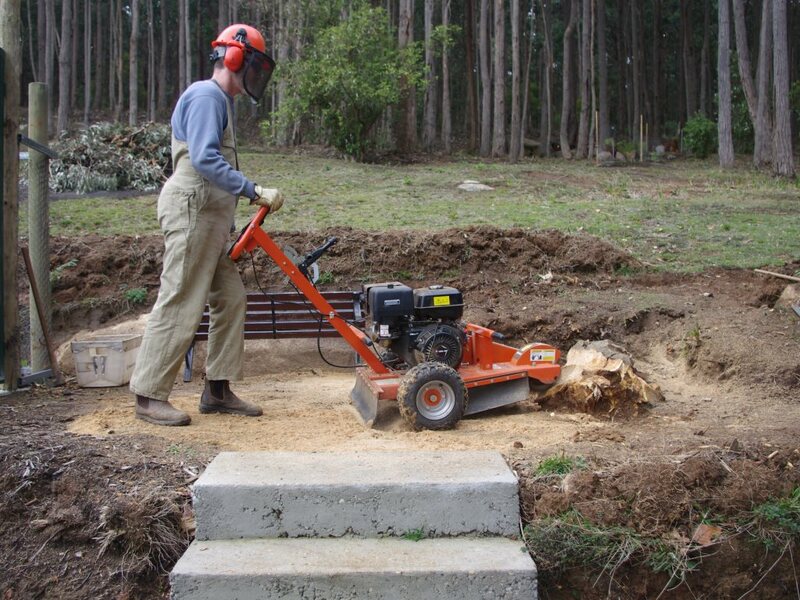 We spent a couple of hours with the tree stump grinder, and turned that huge old stump into nice sawdust which was spread around the garden beds. 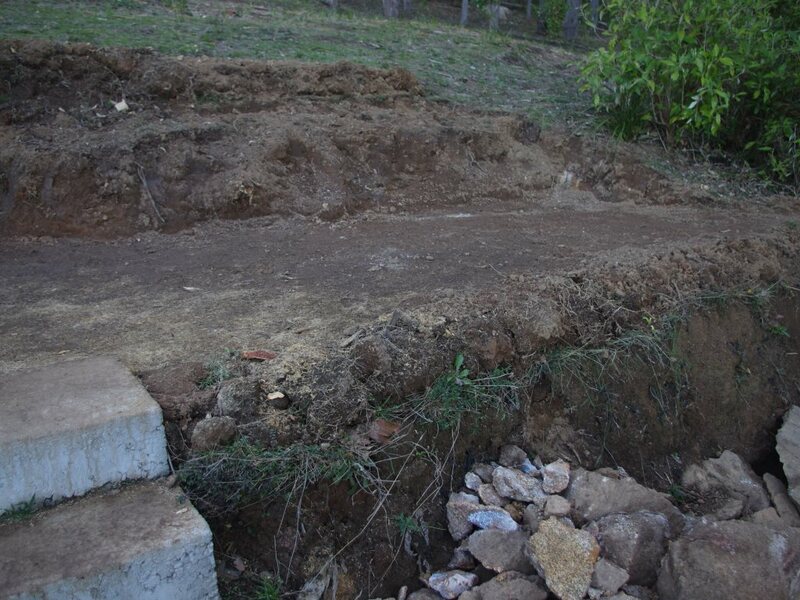 Once the tree stump was removed, we could then continue the excavations. I reckon there is another day or so of digging before we can begin the next stage of the project. 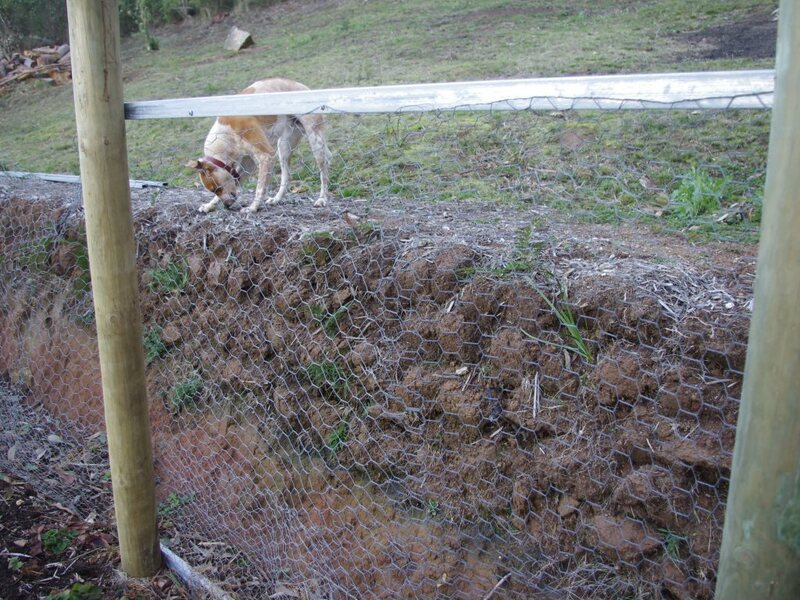 Over the past couple of years we’ve been experimenting with how to retain the soil on the downhill side of a terrace. The best arrangement we’ve found so far is to cut squares of grass, turn them upside down, and then place them like sandbags on the downhill side of any terrace. The root systems in the grass squares hold the edge of the terrace together really well, and they’ve withstood some serious rainfall over the past few years. The gap behind the grass squares is back-filled with excavated soil which gets compacted during the excavation process. As you can see in the next photo we’ve taken this terracing technique quite high and used it to smooth out natural undulations in the ground. All being well, we may get to constructing a new terrace where Ollie is sniffing something that is clearly revolting but probably tasty to dogs, by next autumn. 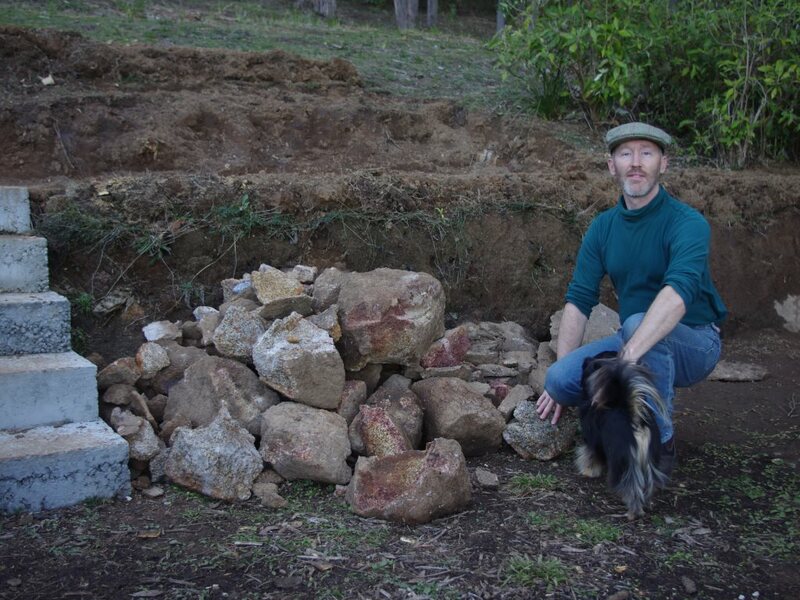 The excavations took much longer this week than we’d anticipated because we unearthed a huge quantity of rocks. Some of the rocks were so large we had to break them up with the jackhammer before we could relocate them. The pile of rocks that we unearthed has become bigger! Looking at the terraces from the hillside above them, I reckon that they’re really starting to take shape. A regular commenter (Hi Pam!) asked me about the sorts of gate latches we use on all of the berry and vegetable enclosures. The latches are really simple self closing devices – and I remember them being in use way back in the day when I was a kid. The gate latch automatically locks in place when the gate is swung against it. 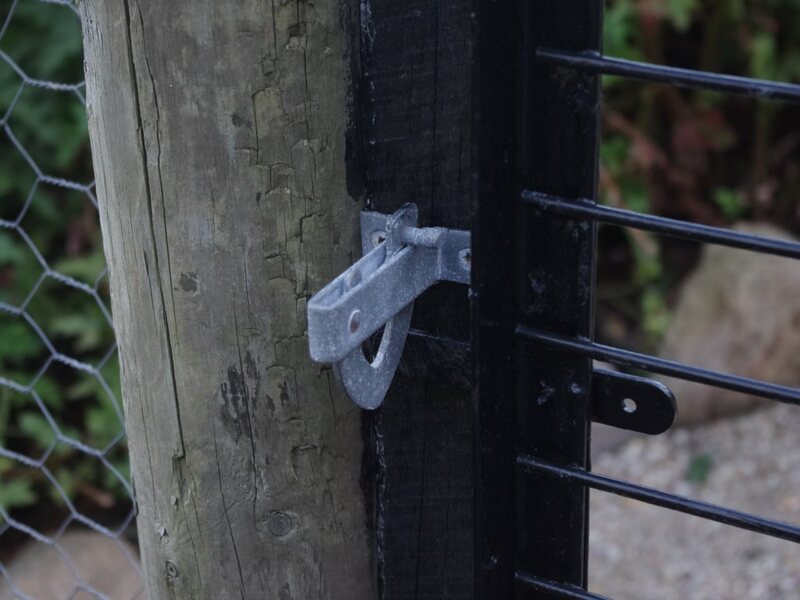 To open the gate again, you have to lift the steel tab which lifts the entire closing device. Of course these latches are only used where the latch can accessed from either side of the gate. And we’ve scored a strike for the Fluffy Empire against the dastardly rodent resistance. The rats were previously burrowing under the concrete slab in the hen house/Death Star and entering into the chicken run. The rats and mice were consuming a huge quantity of grains and chicken eggs. 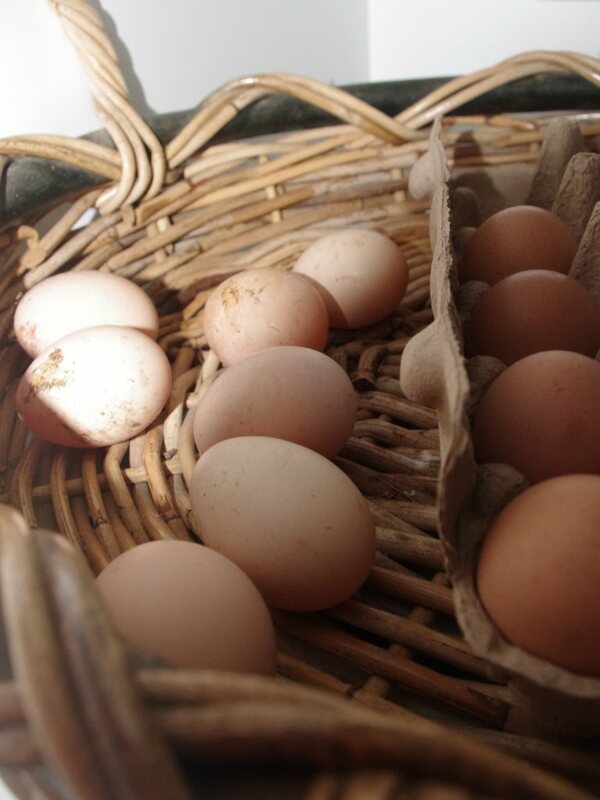 We haven’t enjoyed any fresh eggs for about maybe five to six weeks now. However, with half of the chicken run now covered in a cement slab, we have enjoyed a dozen eggs from the chickens this week. Take that rats! 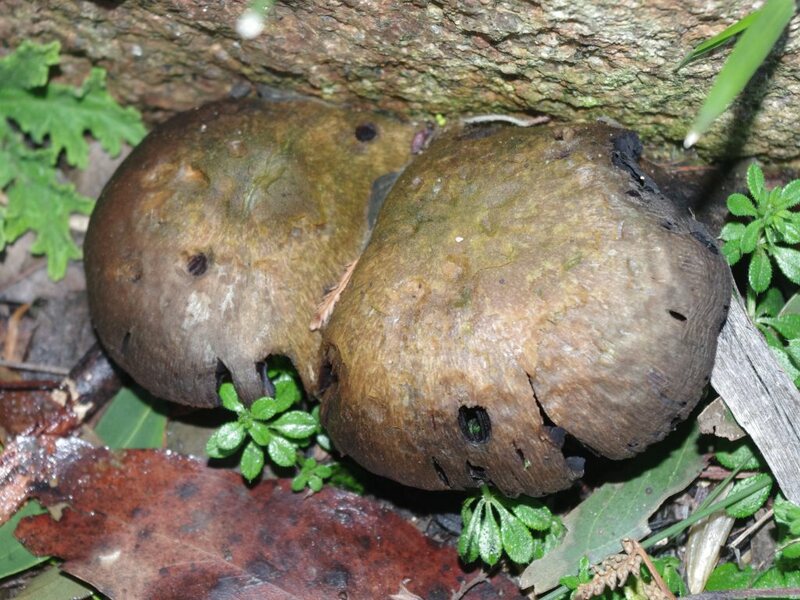 Mushrooms are great because they convert the cellulose in dead plant material into rich black soil. Fern cam (TM) shows that the fronds on many of the recently planted tree ferns are beginning their slow process of unfurling. The temperature outside now at about 8.00am is 4’C (39’F). So far this year there has been 544.4mm (21.4 inches) which is higher than last week’s total of 506.8mm (20.0 inches). Hi Chris, I mulch wormwood and use it in the chook coop and in their nest. They say it helps repel insect pests and rats and mice don’t like the smell. Neither do I, but then I don’t have to sleep in the chook coop! 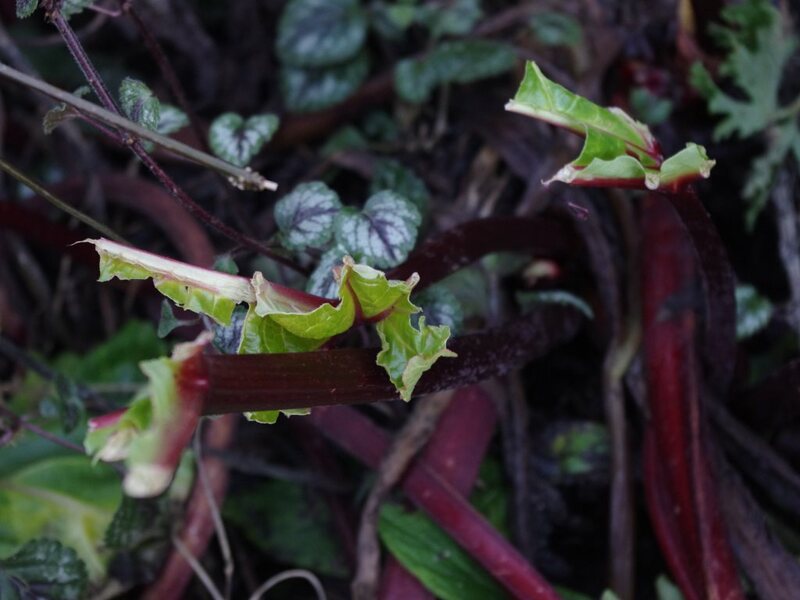 The rabbits here eat my rhubarb leaves. Would it be your wallabies? I forgot to mention, but the editor came across an image of a thatched roof pub on your island and we were both blown away with how attractive the structure looked. The bloke that set up the garden club that I belong to, constructed a delightful looking thatched roof building on one of their properties – which is centred around a lovely old historic building (Heronswood). The club really does good stuff with heritage and open pollinated seeds and seedlings. Of course in such a bush fire prone region as this part of the world, they discovered to their horror that thatched roofs are not a good idea. Let’s see if I can find a photograph… … It is the third of four pictures: Historic Heronswood property damaged by fire. That article is from 2014 so it is a few years ago now, but the owner appears to have had a change of heart about the way forests are managed down here and he supports broad leaved native trees of dry rainforest origins. He’s a smart bloke. I find it sad that it takes such an event for people to start taking a look around themselves, but you know, that is how it goes sometimes. Out of curiosity, have you ever let a student – who clearly knew it all and was happy to tell you all about it – simply fail? I’ve done that with assistants over the years, but then generally helped them recover from the failure, and the lessons learned during that process are burned into their minds. Dunno. It is so good to hear that youngsters are interested in primary production such as pigs and bees. Most people have only the vaguest clues as to where food comes from! Oh well. Hope you liked the link to the local egg farmer. I met him and he is a switched on kid. I wasn’t that switched on when I was his age, and I was very impressed and wish him the best in his travels – which haven’t always been smooth sailing due to some local politics. Is Michael getting a pacemaker or a replacement pacemaker? I hope it assists him with his medical troubles. A few years back I purchased a second hand electric chipper / mulcher. Being electric it doesn’t have a huge motor but it is pretty grunty all the same at about one (or maybe two I can’t quite remember such things although it is called a Magnum) horsepower. I could definitely use that chipper / mulcher with wormwood and sprinkle the chopped up bits in the chicken enclosure. What a great suggestion! I’d be worried about sleeping in the chicken coop, if only because like they say about sea birds and castaways, first they take the eyes and then the lips. The chickens aren’t hassled by my presence, but you know we mustn’t forget that – once they were dinosaurs! Hehe! Exactly, my thinking was that it was the wallabies too. Please keep your rabbits happily down in the SE! Every time I see them here, they are running for their very lives and I suspect the foxes are chasing them. The thing is, a lot of these sorts of requirements are easy for big business as the cost of complying with them gets spread over a large margin, but in small business, well it eats away at significantly smaller margins. It is not like additional demands are free to comply with, they all take effort. We tend to get out of the office and can work directly with small business and sort those problems out, but I don’t know how other accountants manage that as their clients really need help. And the other interesting thing to me is that it appears the requirements are heaped upon small business, but the communication of the new requirements appears to be usually a bit on the minimal side of things. Dunno, that is just an opinion. Oh yeah, and the bills are great too. Some government departments have forgotten that perhaps if they want to get paid, they actually have to send a bill. Instead, I’ve seen a few examples where the onus is on the business owner to check on the government systems to see whether they owe anything. And the fines and interest build up if they get missed. I don’t know of too many small businesses that just expect to get paid without sending a bill. It seems like a bit of a breach of social norms to me, but you know, what do I know. You’ve got my blood boiling!!! Hehe! Hey, we get charged for paper bills too. Like sending a bill in the mail is something that isn’t part of doing business… Far out. Well, I reckon the result is that some people are losing their means of an income. You know, there is no legal requirement that businesses have to maintain their accounts in an electronic format – and I’m old enough to know how a reasonably large business can be run on a paper based system. But you know, some of the requirements imposed on businesses require them to maintain electronic accounts and I wonder about that. Perhaps I am just deeply cynical, but I don’t know. The rate of change and increase in requirements is unrelenting. I would vote for someone who promised to undo those requirements. Anyway, I’ll bet the upper crusts used to enjoy slumming it in the old music halls – just for a bit of real entertainment. Have you ever read stories about that? Interestingly, Jack Vance has used that plot in some of his stories. And Emphyrio which I reckon rated as one of his best, had that as a large part of the theme. It was a great story about the structure our society, but not quite about our society as it was set in the future on a far distant planet. And the process by which the protagonist lost his desire to comply was an interesting read. Ha! I hadn’t heard that acronym before, but yeah, that happens! Let’s hope it doesn’t happen to anyone we know! Hehe! Winds are a tricky business with fires, but they usually drive the direction of the fire. I’d read about the fire in their local papers and saw that name, although when I looked at the images I didn’t notice any mesa’s. It sure looks dry in that part of the world, and I’d wondered what had happened to their tree coverage. On the maps it shows references to forests but what that means in reality is anyone’s guess. I hope that your friends stay safe, but given what their daughter does you’d think that they’d have a good understanding of their risk. Isn’t that interesting, but your mention of the province of Apulia, is the second reference to Frederick II, Holy Roman Emperor this month! Thanks for the education. Is Patience enjoying her travels? And is she having to ply her craft along her travels or is she slumming it? Funny: I am not a princess but was called the princess and the pea as a young child. I had complained bitterly about my uncomfortable bed and something miniscule was discovered under the mattress. Surprised by the depth of your terraces, I hadn’t realised. Is there a reason for this or is it due to the steepness of the land? We often see those latches on gates. Out temperatures etc are in metric; it is just that I am ancient and still think automatically in F and also miles, feet and inches. Can’t for the life of me think why we are doing millimetres instead of centimetres. Son puts a whole garlic in the chickens drinking water, he says that this prevents internal parasites though it won’t get rid of them if they have them already. The wind and rain was so strong that pots all got knocked over and bean sticks went awry. A friend gave some runner beans to a woman who said ‘what are they and what do I do with them?’ I despair! These were beans to eat, not the plants. Yo, Chris – Well, as far as the townies comments, somewhere in that thicket of a brain is probably, envy. The whole princess thing is a rather sore subject here in the States. In some quarters. Many little girls aspire to be princesses. Thank you Uncle Walt! (Disney). Life is not a fairy tale. And to hold out the promise of that is rather cruel. Of course, we fall back on the old saw, “It’s up to the parents…” Who are often missing in action, even when living under the same roof as their progeny. Well, now you can sleep sound, knowing there’s plenty of rocks in the rock bank :-). The young egg entrepreneur is inspiring. Is there hope yet? I think Joe Saltin’s grandkids do the same thing. There’s a young fellow at our local farmer’s market who’s doing the same thing with really good bread. I don’t know all the details of his story, but, I gather, it’s similar. Many calendar worthy pics, this go around. The rainbow, the mushrooms. The wormwood. Which looks like it has frost on it. Onerous regulations do keep the number of small businesses, down. Of course, it does keep the (ahem) accountants, tax people and lawyers gainfully employed. I toyed with the idea of maybe getting a case at the local antique mall, but the specter of all the paperwork makes me think the gray economy is the way to go. For me. Cont. Cont. All those hidden fees. I recently got a renewal notice for the truck plate tabs (they are little sticky tabs that go on your plates so the whole plate doesn’t have to be replaced … though a few years ago, the plates had to be replaced, at a hefty fee, for no apparent reason.) Any-who. Used to be that the fee depended on year and make of vehicle. Then, a law passed by the People that henceforth, all tabs would be a flat $35. Well, with all the ad-ons, it actually cost me $61. A year. Paper bills often don’t even include a return envelope, anymore. As a cost cutting measure. Paper bills usually cost more. Automatic bill pay is another thing I’m leery of. If a mistake is made, just try and get that money back. If the powers that be have their way, everything, everywhere will be on line. Glad I’m old. I need a certain amount of slumming, just to keep life interesting. When I moved in here, the Rev told me that there were some weird people living here. I told him, “Good! I need a certain amount of weird in my life.” That, among other things put me beyond the pale. Which was my intent. I don’t know why they’re calling it the Mesa Fire, instead of the Council Fire. Pressure from the Chamber of Commerce? And, no, I haven’t seen anything resembling a Mesa, around there. As far as the land goes, when I went in the late spring, it was very green with lots of wildflowers. I don’t know why they don’t have more trees. There are cottonwoods along streams and in town. At a slightly higher elevation, they have pine forest that are interesting. Widely spaced and very park like. Not much veg on the ground. Council only averages 24″ of precip, a year. Here, we have 48″. Patience Gray has finally made it to southern Italy. And, found their house and land. She did a lot of jewelry making and writing. Her husband was a fairly well known sculptor. The part I just read was how they envisioned a life of working on their different art. But, they met a younger couple across the road who were, even rare at that time, pretty much Italian peasants, mostly living off the land. And, they got sucked into the interesting and joyful round of growing things and harvesting them. Their friends thought them quit mad. :-). I went out and finally nailed down my blueberries, this morning. The commercial lot. Paid $48 for 14 pounds. About $3.42 per. About half the price was offset by some government coupons, I had. The first batch has been washed and are drying, soon to be ready to spread on pans in the freezer. All augment those with what I can scavenge around The Home. Do I hear more and more labelling of things/people/ideas as simply stupid: “He’s (that guy) an idiot”, they (those people over there) are all stupid”, “that (idea) is dumb” and on and on. What is going on? Hypothesis: As societies become more complex, either any movement or staying stagnant either within or without the paradigm looks absurd. Have we all checkmated ourselves? Is the only move left that of the fool? What is the roll of the fool in fairy tales and stories? Dostoevsky’s The Idiot may offer some guidance here. There are a number of thatched properties on the Island; I think that Shanklin old village provides some and Godshill. I would never buy one, far too great a risk of fire. They used to thatch the old hayricks. Down here, a local used reed thatch as did my husband when he built a barn using nothing modern at all. The land is about 12% to 14% incline, so yeah, that is what you’re seeing. Ordinarily it is hard to see the slope in the photographs, even for me. Such land is too steep for a tractor, or heaven forbid a ride on mower (other than a purpose built machine with a low centre of gravity). Is your land mostly flat, but doesn’t it then decline sharply as it gets closer to the coast? The latches just work – and they make a certain noise which is quite memorable. Actually the long springs that used to get added to gates to make them automatically return makes an even more memorable sound. My grandmother had one of those springs on the gate in front of her house and I can hear the sound that it made in my memory. 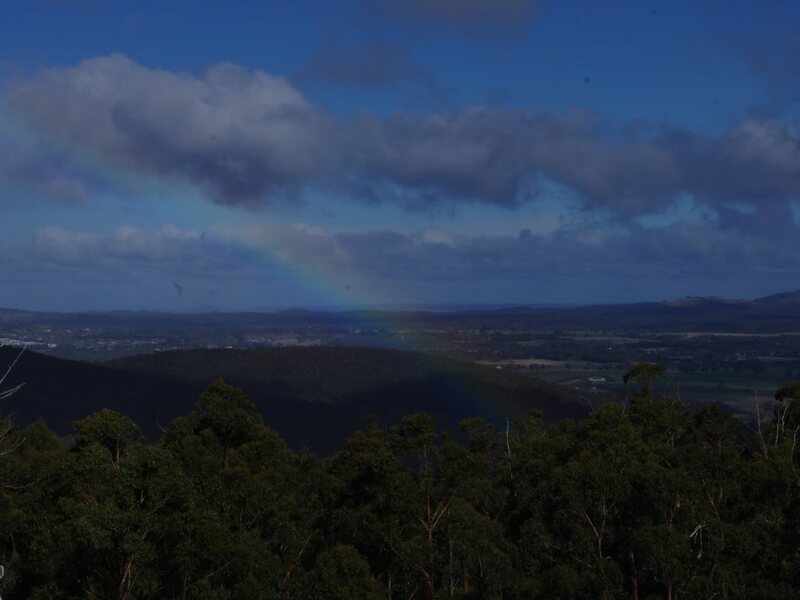 I reckon that is because 12 millimetres of rain sounds better than 1.2 centimetres of rain – but even down here in rural locations people still say half an inch (which is how much rain fell over the farm today). What do you reckon about that? Yeah, I’ve heard that about garlic, but hadn’t realised that it was good for intestinal worms. The chickens here usually live to a ripe old age, so I won’t make any changes to their diets. Incidentally, I’m now getting two to three eggs per day! Those naughty rodents… Perhaps your son may consider a concrete solution to his rodent problem (excuse the pun)? Oh my! I hope no trees came down in the wind and heavy rain? And I’m glad that you had that overhanging branch removed a year or two back. Such things are the stuff of nightmares for me, if only because eucalyptus trees are more prone to dropping branches than the average elm! We don’t have Dutch Elm disease down here and so the elms are huge trees and about as large as a very old oak tree. But not as tall as the eucalyptus trees. That is a wise thought about thatched roofs and fire. I believe the folks enforcing the enclosures used that natural advantage of thatched roofs to their benefit. Not nice people at all. I’ll bet your husband had fun reproducing a barn using nothing modern at all? It is a real achievement to be able to do that. One day, if funds allow (which is an unlikely circumstance), I’d like to get my hands on an old portable timber mill – Oooo the things that I could make with that machine. Oh well, ours is but to dream the happy dream! Nobody has ever expressed that thought to me before. It sure was a surprising and rather candid opinion! Oh well. And I did politely remind him that he was speaking to someone who lived in a rural area. You can never really be sure of people’s motivations, but maybe it was a mixture of fear (for himself) and envy, but I can’t really say for sure. Maybe there was also a bit of anger for his own situation, but who really knows. Some people use anger as an emotion to cover feelings of insecurity, and I’ve met a few people like that over the years. Folks who do that wear me out, and I quickly lose patience with them. There is also the really uncomfortable suggestion in the sorts of situations that you referred to that some people view other people as if they were objects. I’m frankly uncomfortable with such thinking, but you know, it happens. What do you reckon about that? Wow! That is a massive question. Who knows if we’ve checkmated ourselves? It certainly is a possibility, but I’d also have to suggest that energy availability per capita is declining – and has done so for many years. I reckon 2005 was the breaking point for that and we’ve papered it over with debt – which from some perspectives is really a claim upon future earnings. Now you’ve blown my mind bringing in the big gun of Dostoevsky! I put it to you – wasn’t it the court jester who could say things to the King that the courtiers merely thought in the wee dark hours of the night, but were unable to say out loud? 😉 Welcome to the land of Fluffy! “Peanut”! You are killing me with your princess stories! Arggh! I will fall off my chair and come back! You maybe right about envy in the townies comments. I was quite shocked that someone would say such a thing to my face, but you know it happened all the same. About two decades ago when I encountered a boss who displayed sociopath tendencies, I set myself the challenge of peering beneath the veneer of urbanity and guessing at peoples motivations. The skill was refined over that period of time and it sure has earned its keep over the long years in between, but sometimes it would be nice to be able to switch it off and just go with the flow. Sometimes the world can appear to me to be a very grubby place. On the other hand, I’d rather know what is going on beneath the surface and take up the general vibe, than to be run over by events. It can add a layer of serious interest to a casual walk through the city. I had a much more relaxed day today and am feeling pretty good as a consequence. It is nice to be able to spend the day pottering around doing administrative things that I had been putting off. Putting things off is not my usual style, but of late, work has been totally feral. And the admin builds up regardless as to whether I deal with it or not. Because yesterday I was feeling like my batteries needed a recharge, I took myself off to the local post office this morning to ostensibly check the mail, but I really went there to enjoy a coffee, consume some toasted fruit bread and read the latest “Into the Ruins” quarterly magazine of short stories. It was so busy there this morning that I sat outside, but even though the weather was cold and rain threatened, it was quiet and nice because everyone else was huddled inside. Maybe I’ve been living in a rural area too long and no longer feel the cold up here in the mountains? Mate as to the princess thing, I absolutely agree with you. What a better way to divide and conquer the population than feed the story into young girls heads that they’re a princess. I mean they’ll grow up believing they’re a princess and then they won’t want to do anything other than a lot of pouting, complaining and demanding. And who wants to deal with a pouting teenager? And I’ve never watched the film “frozen”, but far out, I recognise the two cartoon characters in it, just from seeing them in various shops over the years. You know, the social arrangements for bringing up kids is just really strange nowadays. People feel that they should do everything. Like literally, everything. I reckon that is an extension of the old story which people used to tell me when I was a kid that: “I could do anything”. So much rubbish in such a short sentence. Even as a kid I knew it for the falsehood that it was, if only because adults seemed to be struggling with that concept themselves… Way, way, way, back in the day people used to wisely say that it takes a village to raise a child. In these enlightened times we feel that we know better. And far out, stranger danger was the wedge which was used to tear that all apart – although it was also a rare reality for some, so the meme had some grounding. Mostly it is the people that are known to you that can be a problem. I’ve heard parents express concerns that their kids are going to be kidnapped – and it is in such moments that I realise that people are really bad at contemplating risk. Mate, down here they no longer issue renewal stickers for car registrations. Nothing. You just pay your annual registration fee. Mind you, most police cars are apparently fitted with number plate readers… I’m surprised more number plates don’t get stolen. I’ve seen concerted efforts between the police and the sheriffs office (which is a different body than up your way – they involve themselves in recovering civil debts and seizing assets) and heaps of cars were pulled over with people having to explain themselves. Shopping mall car parks are a rich source of car repossession efforts for the sheriffs usually involving wheel clamps and a good dose of public humiliation. I once had the responsibility for managing someone who administered automatic bill payments and, well your concerns are well founded because things went wrong despite the best efforts of everyone involved! It doesn’t much matter what people look like if their personality is total rubbish. Hehe! That shines through and through. As to the Council fire, well that is a thought that never even crossed my mind that the chamber of commerce would veto such a name. Although I can recall towns down here begging visitors to return after a fire. Ouch 24″ is not much annual precipitation and that would scare the daylights out of me. I can see how that vegetation arrangement would occur in those conditions. It makes sense. Yummo! Fresh blueberries (said with a voice that could be akin to a zombie hankering for fresh brains, which to be honest is a rather dubious desire, but I never came up with zombies in the first place)! It is cold and wet down here and it is nice to share in the pleasantness of your summer harvest. Glad to read that you are entertained! Who said that allegories can’t be fun and entertaining? Phooey to that thought! Hehe! Stay safe on your chair! Those stumps there are like nothing I have ever seen. Good for you for utilizing the sawdust, too. We have lots from my son’s chainsaw mill endeavors and have spread it all around, also. I have used that upside down sod method to quash weeds. Your terraces are so much higher than ours; ours would be taller if we could build up the mountain instead of only downward, but above us is a neighbor’s property. Actually, I don’t want taller terraces. Thank you so much for more gate latch information. Now I know just what to look for. Have you ever reached peak eggs? When we had chickens, we were giving eggs away left and right, and that was after consuming more than we even wanted. Gee, I remember homemade ice cream with raw eggs . . . The wormwood is interesting. I would expect some animals to eat a bit of it now and then because it kills internal parasites, but maybe it has side effects? One thinks of absinthe. 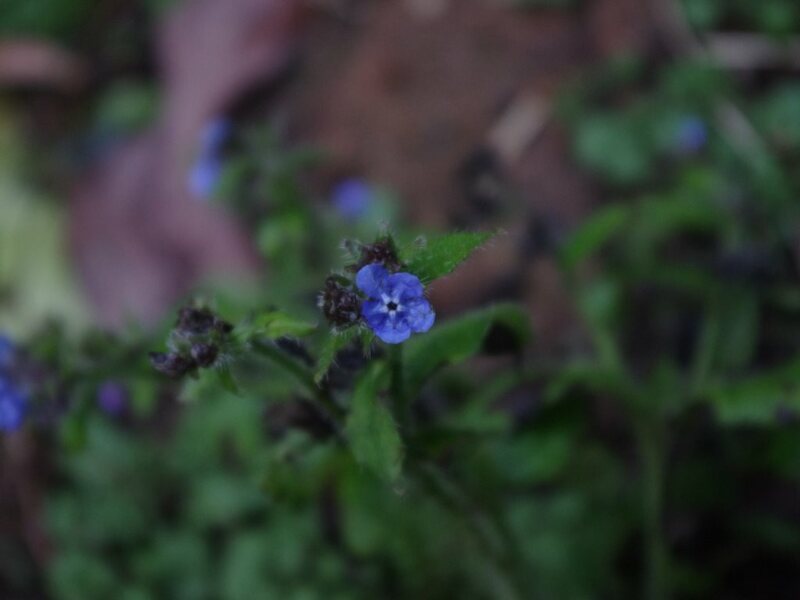 What a beautiful blue the alkanet is. I wonder if it can be used like borage (which I have never tried). Our fig tree – which looked dead as a doornail after the winter – has returned robustly and is producing figs, which I am eating as fast as I can before squirrels discover them. Glad that the chair situation didn’t get too messy! In the photo, the stump was half its original size. The tree must have been huge. Did you notice that where the machines carbon steel teeth had cut into the timber, it looks pristine, rather than what you’d expect for a tree stump that had been sitting in the ground buried over with soil for many long years. The trees here are massive – and getting bigger too as the soil health improves and I get more water into the sub soil. Saw dust is great food for the soil if spread thinly. Turning sod upside down and placing it back on another area is a good way to feed the soil critters and spread worms and fertility. Have you noticed any changes in the surrounding area when you’ve done that? Fair enough because taller terraces mean that you have to construct stairs leading up to them. Are your terraces fairly stable in seriously heavy rain? Yes, I use the alkanet plant exactly as one would use borage – and the chickens love the leaves because it grows all year around here. It is frankly a bit weedy! Which is a good thing. Yum! Fresh figs. Oooo! Yummo! Go easy on those figs! Only small stuff came down in the wind and rain. My land is on a gentle slope but there is a big vertical drop at one point between me and the beach. I have large trees holding the land but the new neighbour has cut his down and built his house on the edge of the drop in order to have a great view. It makes Son and I flinch. I have no view of the sea in the summer. Son is much further back and never has a view of any kind. Produce from the garden is going well but we have not got a hosepipe ban. Most of the fruit and veg has loved the weather. Only the runner beans are disappointing and usually I would have lots of them. Out to lunch yesterday for the first time in 2 months. I had one of the best meals of my life. It was called a sea food bake. What arrived was a soup plate awash with the best sauce I have ever had. I lost count of the mussels. There were 6 whole little octopuses! My lunch friend was horrified at what I was waving in front of her. Lots of shrimps and various pieces of fish. This was accompanied by an excellent garlic bread. To many people this will sound like a vile meal but it was fabulous. Yo, Chris – Was 97F (36.11C) day before yesterday. 88F (31.11C), yesterday. Supposed to be in the 70s, for awhile. Of course, 70 can feel like 90 if there’s no breeze. And, muggy. I agree with your first two paragraphs, in your response. I can often figure out people’s motivations and mental state (usually.) But, as I grow old and cranky, I’m a lot less tolerant and patient. One can get away with so much, with a bit of “snow on the roof.” :-). Everybody needs a bit of “time at the post office.” I guess mine is a cuppa and a bit of conversation, down at the Club. About knowing characters from “Frozen.” I’m amazed at how much pop culture filters into my brain, unbidden. But most of the time, it’s “Who ARE these people?” The “Sharknado” movies were mostly packed with B, C, and D actors and sports figures. Most of them I didn’t know. Maybe they need new publicists? :-). “You Can Have It All” was a meme here, for awhile. Mostly aimed at women. There was a bit of a backlash. But once an idea like that escapes into the wild, it’s almost impossible to squelch. I will never forgive the Burger King folks for launching their “Have it Your Way,” campaign. A repackaging of the old “The Customer is Always Right.” Well, no. As I’ve mentioned before, cooler heads finally prevailed (but not really) and discovered that 5% of a customer base is not worth dealing with. Uses up a businesses resources and wears down your employees. Cont. You are sure one cool customer. If anyone said to me that rural people are stupid, I would have crashed my banjo over his head and drunk all his beer. You are also one clever chap. Of course it is the court jester syndrome! The jester points out the uncomfortable reality of the situation in humorous form and royalty can either take that on board or dismiss the messenger as a fool. I am not sure about whether debt has papered things over. I still see lots of energy being had via coal. So the energy has been somewhat maintained (somewhat), but the per capita has exploded, and the debt is the way of funnelling that wealth generated by the last few chunks of cheap coal to a smaller fraction of the increasing per capita at the expense of the sundry. Is that your reading? Cont. As far as children getting kidnapped by strangers, it’s about as likely that they be hit by lightening. We had a “kid on the milk carton, campaign, here. No one wanted to be the “kid on the milk carton.” “Four Thousand Children in the United States Vanish Every Year!! !” Well, mostly it’s messy custody battles. Mom or Dad snatches the kids and goes on the run. Which, in a lot of cases is all about power and control. Treating people like property. There’s been a few books and articles here about what people are afraid of, and what the chances are that those things will come to pass. There are places to place concern, and places where it’s silly. But those kinds of things don’t get wide circulation. Not exciting enough. I notice that the Mesa Fire has kind of fallen off the radar. If I Google it now, all the news is 1-3 days old. As Cliff Mass mentioned, it’s been mostly grassland fires, so far. Easier to knock down and get to. It’s the lightening fires, in hard to access places that are a big problem. Well, Patience Gray always railed against “The veneer of Edwardian respectability.” She had two children out of wedlock, during WWII. So, she was abandoned by a lot of family and “friends.” But, she found a lot of support among the more artistic and intellectual crowd. Who had their own complex love interests and convoluted family dynamics. Cont. Time (and berries) wait for no man. :-). 14 pounds of blueberries are now in 6 plump gallon bags and safely put away in the freezer. in the middle of that process, I took a walk and thought “Gee, I ought to check the blackberries along the road, up behind The Home.” Horrors! They are ready! So, I picked a gallon and they will soon join their brotheran, in the freezer. I’m shooting for three more gallons. The apples are falling off our little tree. Time to pop some of those in the freezer. As I was walking back down the hill, I notice a tent caterpillar nest in the apple. I could reach it, so, snip!, and it’s gone. And, yes, the garlic harvest is still pending. Another short (I hope) tale of old tech being better than new. I needed a label maker for the library. The Home has one, but there’s a bit of a problem, with access. So, one of The Ladies, bought another one. All electronic with a 35 page manual, power cord and batteries. I am too stupid (and, also too impatient) to deal with that bit of kit. Whatever happend to the old “wheel and trigger” jobs? Well, they still exist. A quick check of our local Mega-Big office supply store (all the small privately owned ones are gone) had them on offer. So, a quick trip to the store. On offer, on line, but no models on the show floor. Just the expensive electronic kit. Oh, and the old wheel jobs are only $10-$14. Should be in, today or tomorrow. :-). Many thanks. You know what? I reckon people confuse good grace and polite manners with weakness. It is most certainly an error to believe that. I have no disagreement with you, because there are still huge volumes of fossil fuels sloshing around and being used. Coal is often reliant nowadays on Oil to extract it and process it, and so it is a very complex story. Another way of expressing: “funnelling that wealth generated by the last few chunks ” is that running down your infrastructure rather than replacing it is another game going on to keep prices down and the game floating merrily along. There is only so far you can take any of those games – but where is that point? Dunno. What do you reckon about that? Nice to hear that nothing too large blew down in the storm. The wind is natures pruning tool! Ah, thanks for the description of your land. You do have massive cliff faces along the coast in your part of the world. I remember seeing those in the drone footage, but some parts of your island looked quite low lying to me – and there were some houses there. I’ll bet the cliff faces are slowly falling into the sea? Yummo! I love fresh seafood. Your lunch sounds delightful. When I read seafood bake, I was put in mind of a large seafood pie, or seafood that had been slow cooked in a large dish. Yum. Humidity is a killer. There was a scientist suggesting that the tropics along with their cyclones are slowly moving more southerly down here and that she would not wish to live in such an area. Where was that: Hottest July on record for much of Queensland prompts warnings of more to come. The appropriately named Death Valley looks set to break an awesome weather record to. Not good and an impressive achievement. In the Annie Hawes books, she mentioned that nobody looked askance at the older folks heading into the bar for a drink in the early hours of the morning. If the younger folks did it, the outrage would go on for decades. I believe Fleetwood Mac sang, something like ‘you can go your own way’, but I’m not entirely sure of the veracity of that claim – although it was a mighty fine song (and album too). That meme is basically harmful because it stops people from doing anything because they’re so busy trying to do everything. But what do I know. Speaking of which I saw an article which expressed the problems with that meme: Young people underestimate how much age affects their chances of parenthood, survey suggests. The youth radio news program I listen to is discussing the results of a survey of 11,000 twenty something folks and it is a fascinating insight into the problems and challenges they face. They put a very brief video together of the results which may or may not interest you: Here’s what the typical young Aussie is like. It would be a bit weird if some kid expressed the opinion to his / her parents that they wanted to be the kid on the milk carton! Can you imagine the fallout from that chunk of stupidity? Hehe! I read a book on assessing risk written by two statisticians and I recall that it may have been titled Panicology. It was a very good book and they covered such bouts of stupidity. And messy custody battles occasionally venture across waters into other countries. What a legal mess. I don’t reckon you own anybody, what a horror that would be. I have come across people who are obsessed with control and they tire me out, and I then avoid them. It is a bit of a mental health issue in some respects. Cliff Mass did mention that lightning bearing clouds are beginning to form in your part of the world. It is a problem here too for much the same reasons. They fly choppers over forested areas and the helicopters carry infra-red detectors. I guess that is cheaper than maintaining the forests. Incidentally in the Green Wizards recent discussion we briefly looked at ore extraction in the Roman world. Hmm, there were a lot of parallels to today. Good for Patience, other than severe disapproval and eternal damnation (which seems like a bit of a big call to me. Surely even satan would get bored?) what else did Patience have to fear? I would have imagined that WWI, The Great Depression, and WWII created all manner of unusual family arrangements and she probably would have found a niche. Uh-oh. What happens if I overdo the figs? I’m thinking, be glad I don’t have an outside loo? Mate, I’m exhausted and bed is calling. I promise to continue replying tomorrow! Until then. I took the train into the big smoke and the editor and I enjoyed Vietnamese street food. Very nice! But am now home, full, and can barely keep my eyes open. I heartily agree with that cheeky fellow. Country folk *are* stupid. In fact they are *so* stupid that their stupidity is second only to that of urban dwellers. Seriously how do you find these interesting people? When someone tries to strike up conversation with me they always want to witter on about the weather rather than to debate the *fun*damentals of the human condition. I am glad to have picked up some handy tips about using wormwood in this week’s discussion. 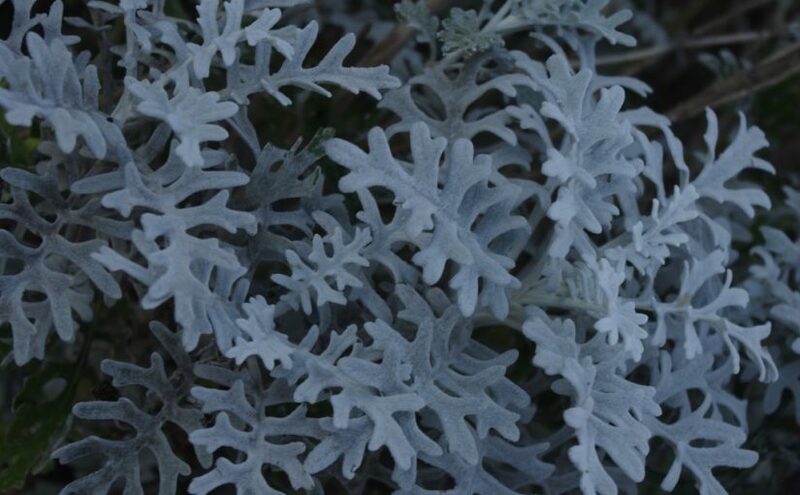 I have a grey leafed plant that looks a lot like the one in your photo, only it doesn’t have a distinctive smell. How much of your smallholding farm is taken up with trees? Now, Chris, on the topic of triple distillation… A discreet shed for a still and soon you could be producing Fernglade rhubarb brandy. You need human rocket fuel to power the terracing activities that you and your editor undertake. Few people will really appreciate just how much physical stamina is required for moving earth by hand (unless of course you have a mechanical excavator? ;-). As usual thanks for all the time and effort you put into keeping this blog a good place to visit. I agree with your expectation of a ‘bake’ it was mine too. I was surprised by the large soup plate arriving, perhaps it was a mistake. But oh it was delicious. No we are not allowed to put down rocks or concrete. The powers that be call it ‘managed retreat’ though there is no management. The Islands cliffs are collapsing into the sea but it is different here. You are correct, it is green and looks flat but where I am there is a long vertical drop running more or less parallel with the beach. It is probably only 7ft high but it is pure clay and rain is disastrous. I am about 15 ft back from it and have trees and hedges. Also my wooden shack can easily be re-built further back. Neighbour has built a two storey house on the edge on a concrete raft. Son is staggered that he got permission for this. Prior to neighbour’s new house there was a wooden shack built by my husband. My husband had had to move it back on one occasion and it wasn’t on the edge but my husband perceived a growing crack in the ground. Weather is dry and heating up again. Yo, Chris – About young people and parenthood. From what I’ve read, even though global population is still on the uptick, developed countries have declining populations. Developing countries are slowing. It all seems to boil down to education. Which is why certain groups try and squelch education. Funny how that works. That was an interesting little vid on a snapshot of Australian young people. Quit a few contradictions. But, that’s humans for you :-). Oh, yeah. The Romans mined a lot of silver in Spain. Tin and gold in Britain. Ice layer investigation shows a big uptick in smelting residue during the Empire. There’s been a bit of interest on the archaeology sites, recently, about the idea that the Romans hunted whales. I guess it’s never been thought about, before. The gallon plus of blackberries are safely in the freezer. Steve, one of the other dudes who lives here at The Home asked how they tasted. He was gobsmacked when I told him I didn’t know. That I don’t eat more than I pick :-). More habit than discipline. Maybe dating back to when I picked produce as a wee small lad. The less that went into the cartons, the less money went into my pocket :-). Or, my knee jerk rejection of offered food. Due to a.) most is not what I consider “good” for me and b.) once I get started on something, I don’t know when to stop. I thought about that and did try some berries as I was washing them up. Two. They are quit a bit sweeter and plumper than where I lived before. I think that’s due to the springs on the hillside. I picked the first gallon of blueberries, here at The Home. I got those off the back side of just two bushes. It’s a bumper year for blueberries. That reminds me. There was an article in the newspaper about an agricultural investment firm that has quietly put together about 1,000 acres of land, just out side of Toledo. Which is about 20 miles due south of here. It’s all going to be planted in blueberries. It’s interesting that the firm has had no communication with either the town of Toledo, or, the county. The ownership is all rather mysterious. Chinese? Always a possibility. Yes they are great for constipation. This is likely an issue you see regularly on the farm, and I would be interested to see how you explain this, but we reached a point many years ago when it became cheaper to replace many or most things than to maintain them. Now I think a lot of old peak-oilers did not predict that, thinking that shiny new things would be the first to become unavailable, instead of getting things repaired becoming unavailable. That of course may still be in the, er, pipeline. I don’t doubt you about the education issue and child rearing as education can open different opportunities and perspectives to people that they otherwise may not have had. But more importantly it allows for the sharing of a wider variety of ideas and stories than would also otherwise be available to the population if it had access to only a restricted range of stories. I also believe that there are many paths for people, and part of life is accepting that there are all these different paths, but you know, even in developed countries there is still an effort made to steer people down a certain narrow path of choices. It is really up to individuals to define their own choices. But you know, I reckon in the future as the available energy per capita declines, well, that is our food supply were talking about, and without the sort of food supplies that slosh around these days, folks are going to be hungry (for a while anyway). But with hunger too comes increased disease as people will be less resilient to disease and so we rely on fossil fuels at our peril. I’m not cheering for that outcome as I reckon it is a combination of choices made to date, and I reckon as a society we are really losing the opportunity to build our top soils with all that waste. We’ll definitely need it in the future and it does harm in the oceans. Glad to hear that you enjoyed the snapshot of the youth down here. They’ve been going further in depth into the aspects of the survey each evening. I sort of missed the discussion this evening as although I had the radio on in the background, the jackhammer was much noisier by far and I had my ear plugs in – no point going deaf because of power tools. We worked right up until dark this evening. Yeah, that is what I learned last weekend too about the Romans. I had no idea. Did they use slaves in the mines like they did in the broad acre agricultural practices? And whales? I’ll bet they coveted the whale oil which was used at some points in history for lighting oil. I’ll bet the smoke smelled rather distinctive… Personally, I’d go for olive oil, but that is just me. The inverted bell shape curve of their extraction of ores looked eerily similar to other inverted bell shaped curves. Patience was a sensitive soul to have understood that the ways that herself and Norman had taken up could well have been lost. I wonder if anybody in the film crew suggested that: “You two sure do work hard!” Hehe! It is interesting that the Germans took an interest in such a life, although I recall from Annie Hawes books that there were more than a few Germans settling in the hills of northern Italy. Hey, did you see that there is a prediction that Europe’s all time weather records look set to be broken this weekend (Portugal and Greece)? Yeah, I’d be thinking along those lines too with 1,000 acres of blueberries. My but we sell our top soils on the cheap. Incidentally a 1,000 acres of one crop is like an invitation to every pest and disease known to man (and some that aren’t) to test their mettle. What could possibly go wrong. Yes, alkanet is a ground cover that produces leaves all year around and survives heavy frost and the occasional snow. It is frankly a bit weedy, but it is such a good companion plant to the fruit trees in the orchard and they really grow much better with it inside their drip line. It is of the borage family so it is a very useful plant. It has most certainly spread through the forest in higher locations here. 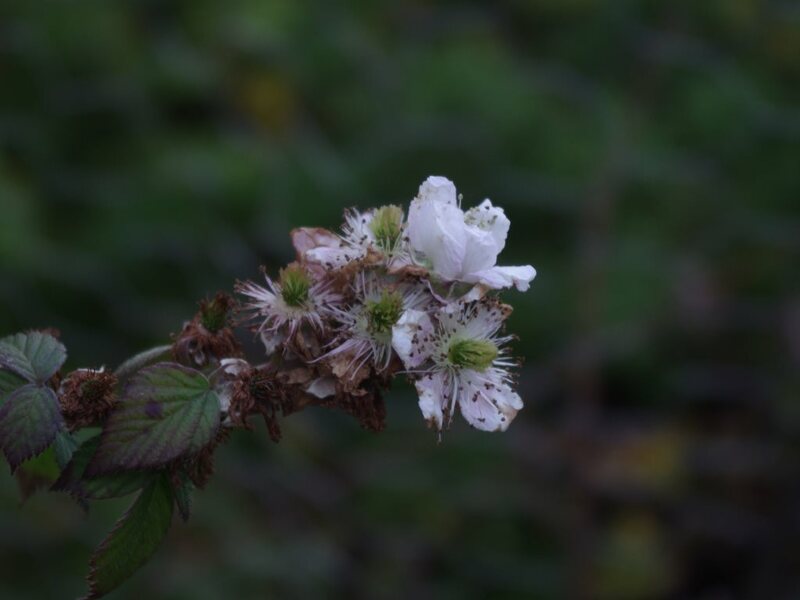 I once saw that a road grader had ripped up a patch of the plants and then the next year, there were alkanet plants all over the place. It is such good stuff. Gotta bounce as we’re off to the pub! Apologies – I’m slack. It’s true, but I promise to repair this character flaw with replies tomorrow evening. I had no idea that you were that close to the sea. Oh, the air . . . I can smell it now . . .
Actually we are moving tomorrow. Other than big furniture we are/have been moving the rest ourselves as the new place isn’t that far. It’s nice to have things at least a little set up. Often we’ve packed up boxes and unpacked at the new house and return with empty boxes. Don’t know when we’ll have internet after today as we’re still working on options. Have the same company we have here coming out on Saturday morning to see if it’ll work at our new place. I’m thinking one more week and life may become somewhat normal – whatever that is and I can catch up here. Yo, Chris – Education comes in all kinds of different flavors, and a lot of it is just being well informed. Widely read? I’ve been following Greer’s series, and find it quit informative. I’d run across references to, and bits and pieces of, what he narrating. Nice to have it all pulled together. The Romans used slaves and criminals to work the mines. The whole “Roman whale industry” is pretty speculative. Mostly based on whale varieties that went extinct in the Med. I don’t remember any mosaics of guys in a boat with a harpoon. :-). Of course, there is that tale of Johnah and the whale, which would have happened in the Med. Way back before the Romans rose to power. Yup. Vinca acts pretty much like Alkanet. I first noticed it when I was out shopping for a cemetery plot. Here it was, February, and all this stuff was blooming. And it was blue! :-). Goodness! How much freezer space do you have? I was hoping to find out what happens when one over indulges in figs too! We turn all of our meagre supply of figs, but mostly supplemented with trays of the fruit purchased at the Queen Victoria Market, into jam and it is very good jam indeed. Have you ever tried or made fig jam? How is your winter going? Are you getting some winter rains? The two states north of here are in drought, but the winter rains are arriving with some force here. It is almost getting too wet to excavate. Hehe! Thanks for the laugh! Very funny. I make a habit of talking to most people as it is nice to take a ‘vox pop’ of society so as to take a sample of the mood of the population. I can’t in all honesty suggest what the motivations of the individual was, but I did sense some feelings of anxiety and fear. From my perspective there is this historical context which suggests that on a long term average, something like over 90% of the population is usually involved in subsistence agriculture because that is representative of the potential lifestyle provided by the annual energy budget of the sun. That outcome can take all manner of forms and it is a topic that few people who are not involved in agriculture want to hear. It doesn’t make for pleasant listening, don’t you reckon? You don’t tend to expect too much from people do you! 😉 Hehe! Who is brave enough to discuss the fundamentals of the human condition anywhere! Far out! Hehe! 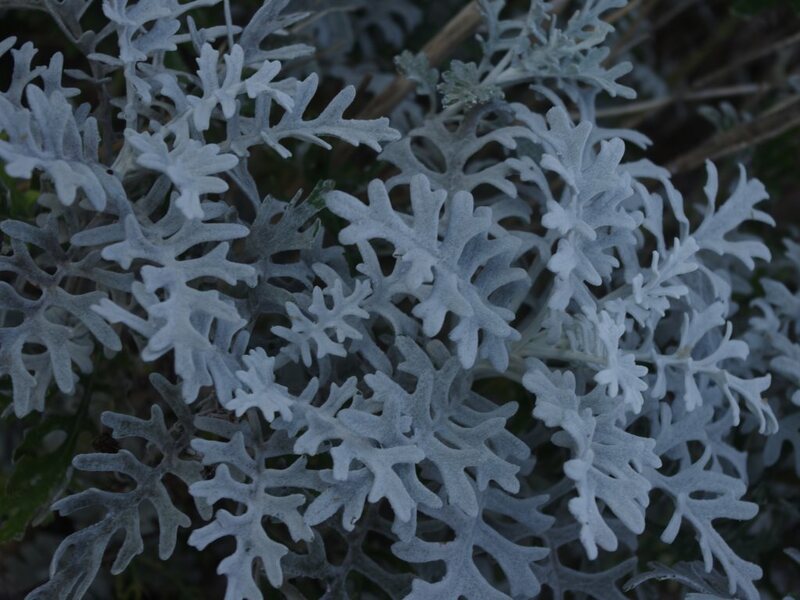 The smell of the wormwood may vary with the seasons, and it is raining outside right now and so the plant may require a bit of sun to reproduce any fragrance and take a sample. Do you have chickens? Well over 80% of the property has a dense stand of young and tall eucalyptus forest. Most is regrowth from the 1983 Ash Wednesday fires, but I give the older and larger trees which survived that fire particular care and attention because they are special for the forest and the critters that live within it. Nothing much lives in a young regrowth eucalyptus forest, but the older trees are like a biological skyscraper. Exactly. You know, I have never stopped hard physical work in my life, and the movements come naturally after years of trial and error and listening to my internals. It would be an enormous ask for other folks who have not done so to join in the fray. Hey, I dream of mechanical excavators, but then once you move ahead faster on projects, well, isn’t it obvious that there would then be more to do? Best to move at a human pace. And also, I’m going to chuck this thought in: If you move at the pace of a machine, you rarely get new insights, or better ways to do things. Plus, I find that the physical work is very meditative and enjoy it for that aspect alone. Your seafood lunch sounded delicious to me. The editor and I recently stumbled across a place that specialises in chowders and we have made an initial foray into the menu. It is a tough job but someone has to do it… The chowders have a good stock, but with seafood being the price it is, and competitive economic pressures, the soup is a bit light on for chunks of seafood. That makes perfect sense though. We had a lot of accounting work to do today, so we got up at a stupid hour of the morning and hit the books. Who knew that it was dark before the sun had risen? As a reward we went out for a very late lunch (well after 2pm) and enjoyed a split pea and ham (off a boiled ham hock) soup with fresh sour dough bread smothered in butter. Yummo! Lunches like that make all the work rapidly fade from a person’s mind. I’ve heard that tale about ‘managed retreat’. You may be interested to see what it looks like down here: Byron Bay divided by Belongil Beach rock wall plans. I reckon that trying to fight the ocean is like engaging in a losing battle that will consume all of your resources. Your husband displayed clarity of mind to have moved your building further back and away from the cliff edge – even when it was not under imminent threat of collapse. A lot of housing structures were historically constructed so that they could be easily rebuilt at some other location. A lot of cultures understood that aspect and risk, including the Aboriginals down here. The Japanese also spring to mind in their understanding of the transience of the built human environment in a complex and shifting landscape full of environmental challenges. The weather here looks set to be taking a turn for the wetter (if that was possible). Oh well, the fern gully was enjoying a good drink of water this afternoon as another half an inch of rain fell today. The bees are over wintering quite nicely, and they seem like quite a gentle breed, but using a lawn mower or other machine near the hive can lead to some awkward situations. You know, if the bees die out, I have plenty of native species that will take up the pollen and nectar challenge. I get very little honey from the bees here anyway, but I have a deep suspicion that people ask too much from the humble honey bee and that stresses the hives which in turn makes them prone to disease (that story should sound familiar). Mind you, I’m guilty as, because I enjoy honey regularly and use it in my home made toasted muesli mix and dog biscuit mix. I purchase honey off a lovely couple living out in the middle of nowhere. They’re really lovely people. The bees here provide pollination services and that is about it. Oh my goodness. Way back in the day the old timers used to say: Reuse, recycle, and repair. Well, I’d be curious as to your take upon my take on this matter? I can no longer tell what item will be good, and what will be total rubbish in advance of the purchase. My methodology is mildly wasteful because firstly, although I keep things very simple here, I also have to work out what is going to work and what won’t in the long run. That process alone is a wasteful thing to do. If I knew of a better way, I’d try it. Generally I begin with whatever is cheap and looks OK, just to see whether there is a demand for the use of that item. Inevitably it breaks and is usually uneconomical or impossible to repair as it was never designed to be repaired. And then I spend progressively more to obtain an item that is repairable and built for longevity until I get to a happy medium where things are ‘good enough’. Those items are around, but sorting the wheat from the chaff is no easy thing. Plus, I’d also have to add that I am learning to be very gentle with machines (take the solar power system for just one example) because most are not designed and constructed with longevity in mind, although some are and you’ll never know which is which. But also more importantly, I’m learning to maintain and repair the things that support the farm, and also learning to keep out of trouble before it is entered into. This is not an easy or quick process. And, I’d also have to suggest that quality varies across time and sometimes things were just better built back in the day. What a mind blowing question! Hope the moving went well – and nothing got broken (or stirred!). Given how long you spent in the previous house, I hope that you have cut yourself (and Doug) some slack time to adjust to your new circumstances and living arrangements. I like smaller houses if for the only reason that there is less house for a person to maintain! Your methodology of moving houses sounds very much like what we do. And I hope that the guys moving the furniture turned out to be OK, although I would be surprised if it were otherwise given that they were distantly known to you. Poor Michael. How is he about the prolonged stay in hospital and all of the discomfit? The medical industry appears to make some serious money on the back of over pathologising tests and I’ve had to fend that off from time to time when I went in to see the doctor on a completely different and unrelated issue. For some reason the phrase comes to mind: Do you want fries with that? I dunno what to make of that. I sincerely wish Michael the best and that his stay in hospital is as brief as his recovery is speedy. Believe it or not, we had so much accounting work to do today that we got up before the sun had even crested the ridge above the farm, and was nary to be seen. Who even knew that it was dark at such times of the morning? I staggered into the kitchen being hounded by happy hounds desirous of their unexpectedly early breakfast. Swatting the hounds away, I eventually took solace in my coffee. Only then did I have the clarity to face the day. It was truly awful. Some idiot sent an SMS text message on the phone in the middle of the previous night offering cheap business finance. Not happy with them at all. Fortunately we eventually finished the work and headed off the farm, and were able to enjoy a late lunch (well past 2.30pm) of split pea and ham off the hock soup with fresh sour dough bread and butter. Then there was a cake smothered in fresh cream. After the lunch I really did want to go and enjoy a quiet nap and sleep off the lunch, but woe is me, such was not to be my afternoon. More work was in store. Mate, it rained and rained here today 8 hours so far and about three quarters of an inch. We were hoping to continue the excavations tomorrow, but I don’t really know about the combination of water and clay. I have a cunning plan though to defeat the evil forces of mud, and may implement it tomorrow. But that requires more work. Oh well, mustn’t grumble. At least the fern gully enjoyed a nice drink of rainwater, as has everywhere else really. Not much is growing at this time of year. On the other hand, I had to lower the height of one of the water tanks yesterday, and I’ll begin the slow process of refilling it with water tomorrow and Sunday. At least I seem to have the electricity to do that trick now that the sun is slightly higher in the sky. Yay! It sounds pretty hot in your part of the world now. Have you noticed that the sun is setting earlier yet? The concept of ‘education’ is an abstract concept itself, and as such it lends itself to whomever wishes to take it. 😉 Like you, I believe that an education can be gained in various manners whether it be by reading widely, or having real world experience. And bits of paper displaying awards achieved are nice, but they only really grant you a modicum of specialty in a single area which does not extend beyond that area. The world is a very large place. Yeah, I’ve been reading Mr Greer since about 2008 when an old friend introduced me to his writings. I’ve read every blog essay and a few books of his books to boot every week since then. I try to read most of the comments too, but there are only so many hours in the day, and some comments frankly bore me and I rapidly move on. Some weeks however, I am flat out and outside of replying here and writing, I have very little free time. One can only do their best. But I always try to contribute ideas or perspectives as I realise that Mr Greer is a student of the world of ideas. Such is the stuff of food for Mr Greer! I respect the fact that you are very well read. It is a good thing and useful purpose to put ones life too. I’m enjoying the current series written by Mr Greer too. Yes, I have encountered those folks in some strange corners of the world – and have no beef with them. The problem for them as I see it is that they leave themselves open to the traditional meaning of the word ‘hubris’, and I mean the definition from way, way, back in the day. Nobody really wants to go where that word leads you. Exactly, Sisyphus is a great example. There is some truth in your humour! But yeah, you know, far out man, I must have done something extraordinarily bad in a past life to have to deal with so many rocks. Yesterday was epic, and after a while I felt that I must have hit an old lava flow because one after another large rocks had to be broken up and removed out of the extension of the strawberry terrace. We’re racing ahead of time to construct the enclosure and plant the three sisters corn patch in there before about the start of September. There is a lot of rock in there. You wait until you see the photo of the rock pile – it is feral! By sheer coincidence, we travelled past the property with a natural spring that we didn’t purchase way back in the day and you know, I’d have to suggest that the block didn’t have enough rocks or trees and so whilst it had a natural spring, I’d have to suggest that rocks and trees are good resources too. 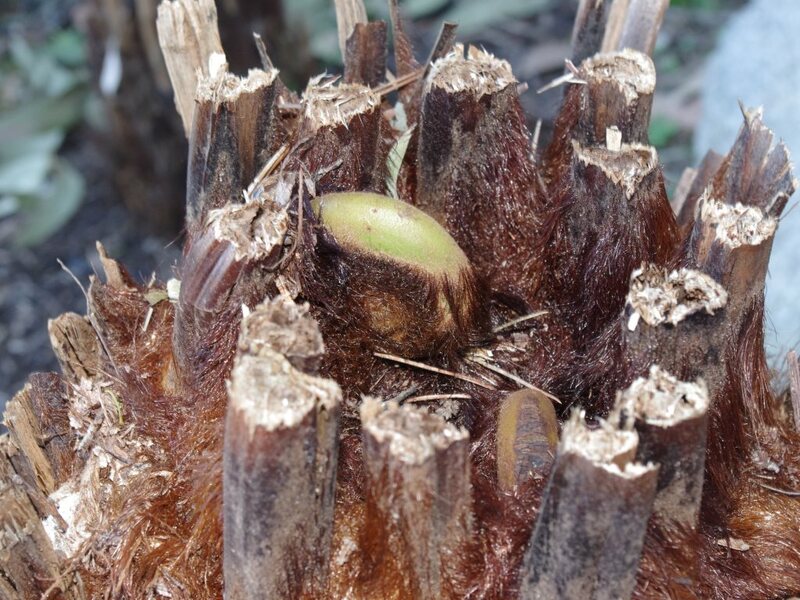 Blood and bone meal is an awesome feed for your corn – and much better than mincing up road kill to chuck on the garden bed – although it is much the same outcome. Imagine the horror of the ladies and the Garden Goddess if you chucked a chunk of road kill into one of the garden beds! You’d never hear the end of the matter! It would work though. Ouch. From historical accounts where the Romans particularly harsh on their slaves and criminals? Mine work is complex and dangerous and the folks would have been highly trained in order to undertake that work. I’d never heard of Vinca before, but what a lovely plant – that loves hot weather. A very useful ground cover. Do the insects like the Vinca flowers? It is a nice idea to have flowering meadow on a funeral plot. I forget, but are you intending a ‘green’ burial with minimal preservatives and an easily composted casket? It sounds a bit morbid doesn’t it, but it is a nice idea to feed the soil and produce flowers. I’d heard that about Elephant garlic, but also did you know that society garlic is of the allium family of plants? Good stuff – and a bit weedy to be honest! Yummo for the blueberries. You have put away an impressive collection of berries for the year. I spotted this article on ecology down here which I thought that you might enjoy: How planting trees and grasses can help stabilise farmland in a changing climate. Ecologists do it tough because people aren’t trained to think in terms of a system. I guess there are some advantages to thinking that things aren’t a system, but with advantages there are inevitably costs. @ Margaret- I’ll keep Michael in my thoughts. In lieu of the traditional houseplant, I send you good wishes on your new home. @ Inge – Well, I have a pretty roomy freezer in the standard fridge. And, when I moved in here I bought a small freezer. The exterior is slightly less than 2×3 feet and it is slightly more than 3 feet tall. I didn’t plan it, but it turns out it’s the best work surface that I have. Wonderfully handy. Yo, Chris – Sounds like your business is keeping you hopping. But, you said it was the busy time of the year. At least frequent applications of good tucker keep you going. The chowder place sounds yumm-o. We had a bit of rain, overnight. So, I won’t have to water the garden, this morning. Fine by me, as I want to clear off, early. The send off for the Warden is today, and things are feral, around here. I said my goodbyes, yesterday. Yup. I’m beginning to notice the shorter days. I walk Princess at the same time, every evening. Just a few weeks ago, it was still pretty light, at 9:30pm. Not anymore. Well, by the time you’re pushing 70, you’ll be well read, too :-). Not that you aren’t, now. Yup. Turned 69 a couple of weeks ago. So, it’s official. Pushing 70. Ho-hum. Some weeks I pretty much skip Ecosophia. When he gets too deeply philosophical or metaphysical. I always know, as my eyes glaze over. Ditto, the comments. Yup. The Romans were pretty tough on criminals. Not squemish about capital punishment. And, it was all pretty public as an object lesson to the population. And, entertainment. The arena. The cross. After the Sparticus slave revolt was put down (around 70BCE), the Appian Way into Rome was lined with crosses for miles. Slavery was a complicated issue. Yes, an owner had complete control. But, to kill a slave for no particularly good reason was frowned on. There was a certain amount of social pressure if you didn’t treat them with some care. And, there was a fairly well defined road to freedom. Augustus once stepped in and saved a rich man’s slave. He had broken an expensive goblet and was going to be fed to the eels. Cont. Cont. On the other hand, if a slave killed his master, the entire household was put to death. There was an incident (I forget when) when 300 slaves were to be put to death, down to the smallest babe. Public opinion was to spare them. The Senate agonized for days. But, finally, the sentence was carried out. Standards and law must be maintained! Oh, I’m having a no fuss burial and cheap casket. Unfortunately, in this part of the world, a “burial vault” is required to put the casket in. Think, concrete septic tank. :-). The thinking is, to protect ground water. Actually, I think it’s to save the groundskeepers problems with the sinking in. Makes it tough to mow. Yup. The Vinca does attract the bees. And, I must admit I’m a bit miffed about the Mason bees. They’re pretty much done and tucked into their mud burrows by the time garden produce starts to flower. Well before the fruit trees. So, yes, they do help with early spring pollination. But food crops? Not so much. On a personal level, reuse, recycle and repair is a very sensible strategy peak or no-peak oil. Breaking and repairing things, if you can afford it, enables you to become famililiar with their strengths and weaknesses. Did you not say one time that you don’t understand a plant unless you first kill it a few times? What I was talking about is more on the macroscale, that at least 10 years after peak oil, and at least a generation after peak energy density per capita, it is still generally more economical to simply buy the shiny new toy than to get the old one repaired, if even possible and if you can afford it, and so much of the material we depend on is basically unrepairable. My take is that they (the old peak oilers, not necessarily old timers) expected repairing to be essentially the only option at this point, hence the readoption of the mantra of reuse, recycle and repair, as sound a strategy it is peak or no-peak oil. But that is likely too linear. Like the climate change activists basing most of their argumentation on increasing temperature, and neglecting to focus on the messy, non-linear variation in temperature extremes, energy constraints also lead to all types of messy, non-linear, hard-to-predict consequences as the remaining flows get diverted into all types of fanciness. It is incredible the computing and electronics available, the diversity of choice one has to sort through, at the same price as a high quality hammer, if you can get. “and were able to enjoy a late lunch (well past 2.30pm) of split pea and ham off the hock soup with fresh sour dough bread and butter. Then there was a cake smothered in fresh cream.” That sounds so good. And no-one deserved such a good lunch more than you and the editor! It has been raining here for a week. Today was quite torrential, but – by golly – we haven’t had to water the garden for quite a while. We have so many different kinds of native bees of all sizes here, and pollinator wasps and flies, that I never worry about things being pollinated. Even the paw paw tree – which apparently is very particular about what pollinates it – has little paw paws on it. I think it is because we have such a variety of things growing here now, protected within the garden from deer and I greatly increased the number and types of herbs this spring. Oh, Margaret, I am so, so sorry that it is going so hard for Michael, and those of you helping care for him. I expect that you will be moved in by the time you see this, so I hope that it went smoothly. My best wishes for joy in your new home and may everything go better for Michael. Hehe! It was really good stuff, and not to tease you, but they bake the bread onsite using organic flour in an historic brick Scotch oven. I tell ya, I’ve been baking bread for over a decade (and hopefully next autumn I’ll get into growing bread wheat), but I have to say it’s a bit like when the Devil came down Georgia – he knew he’d been beat. Mind you, I suspect the home grown wheat business next year will sort the (real sorry for the bad wheat pun, no actually on second thoughts I’m not sorry at all!!!) wheat from the chaff. What a groaner! On a serious note I reckon I’ll be able to get more of the oils into the flour than what the commercial suppliers can – and the oils add a lot of taste and nutrients to flour. In commercial processes it has to be removed otherwise the flour can go rancid – and nobody really wants that. How good is your weather compared to last summer? And the heavy rain is nice to reduce the fire risk. I’ll be curious to hear how your autumn goes, because it was almost never ending here – and then one day in mid to late May (your November) colder weather leading into winter arrived with a resounding thud. But the growing season just went on and on. You live in a blessed area to have so many different pollinators, and I worry about the European honey bees, but I also have to remind myself that they’re interlopers and that there are plenty of other pollinators around competing for the nectar and pollen. I mean, take tomatoes for one example. The European honey bees won’t touch the flowers, but plenty of the local insects enjoy the tomato flowers and the fruit always sets. My understanding of your property is that you have a diversity of established trees and shrubs, so you know, with that comes all of the different insects that go with that. It is a good thing. 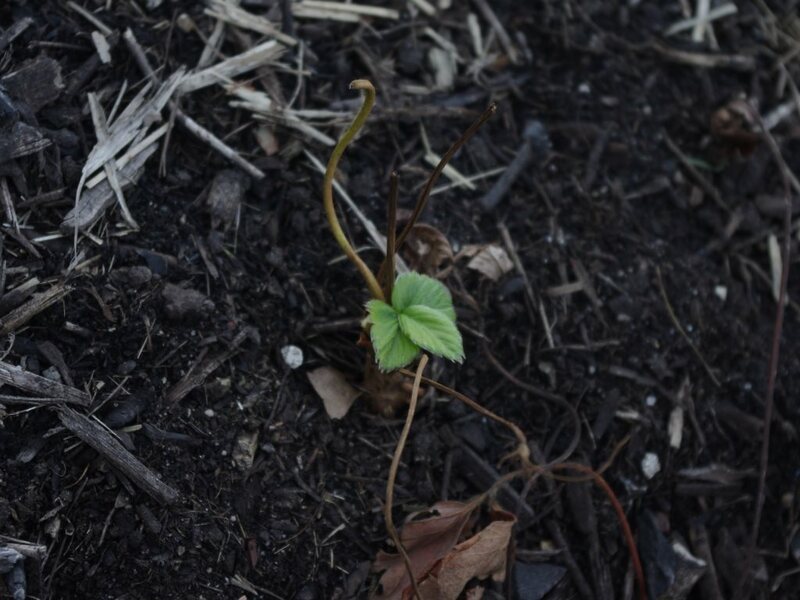 In regards to sugar, I’m experimenting with sugar beets and sugar maples. Neither plants seem to complain as much as the European honey bees when having their sugar stolen, which to be honest they can follow up on their threats with unpleasantness. Oh my! Thanks for the reminder. I completely forgot to plant out the paw paw seeds and have left them in the refrigerator… Ooops! Well, I sort of reckon the same rule applies. I have tried coffee shrubs a few times over the past few years, but the occasional snowfall inevitably kills them off. But until the snow, the plants loved it here. Machines are much the same, and your goal is to see what you can live with and what you can personally manage and repair. My understanding is that we reached peak oil in 2005 and have been on the descent since those heady days. Mind you, we still enjoy an enormously large availability of energy per capita historically speaking, but most certainly we are on the downward slope – no doubts about that. That shows to me as costs rising whilst incomes are stagnating. Yes, I too reckon that the slope is not linear but more of the downward slope of a sine wave curve. If people were seriously concerned about climate change they wouldn’t agitate for action, they’d take action. I’m sorry to say, but it really is that simple. I’m guilty of over subtlety, so perhaps I’ll spell it out bluntly: Now is the time to test out and learn to live with any non centralised machines and devices that you decide that you need in the future. Of course opportunities will arise in the future for this, but what does it mean to you when the electronics are cheaper than a quality hammer – and who is subsidising that economic equation? It is a really complex problem which has no solution. It is your task to navigate the situation. Mustn’t whinge, but I guess we brought this work situation on ourselves, if only because we’re cheap. 😉 There are projects here that are begging to be done and I feel a bit of conflict. Hopefully things settle down in another month or so. It happens from time to time and you can never predict when it will happen and then when it will settle down. When soups are done well, they are a thing of beauty! Food is one of my joys, and it was one of the reasons that began me on this strange journey! Who wants declining food quality – yuk! Best to see how plants grow and then taste them fresh for yourself, is what I reckon anyway. I read an interesting statistic about the number of people working in farming down here and the numbers did not make me feel too comfortable. So many people relying on so few, and a very well known economist was suggesting something along the lines of apparently questioning support for farming in a similar vein as textiles and the motor vehicle industry. Such thinking did not end up too nicely for those two industries down here. I’d be very nervous about an import centric food supply. It is such a nice thought to get in early with goodbyes to the Warden. Large send offs are very impersonal affairs. I hope the adjustment period to the new Warden is not particularly traumatic for anyone in your establishment. Keep an initial low profile as the person may look to make an example of someone – you know what you are doing though. What do you do, change is eternal. I dunno, I take a fairly flexible approach to change and it sort of works for me, but the heart never seeks change, but that sneaky beast of time and entropy always rises up from behind the couch (or desk in your case) and steals something or other. We must be vigilant against this sneak thief – not that I feel that it will do us much good. Congratulations on the recent birthday and I did note that you celebrated it in style, which I approve of. You’ve told me that confession is good for the soul, or perhaps I’ve only imagined that and you’ve told me to keep my opinions to myself 🙂 , but you know I enjoy low key birthdays and I just, you know, plant some ferns and go to the pub for dinner. Mind you, now that I mention it, that sounds like a usual week down here. Imagine if we were stuck in some sort of temporal anomaly and every week aged us a year. What a horrendous story that would be! Fortunately time seems to move on at the same old pace, but I tell ya what, I reckon it moves faster the older I get. What is your take on that? My eyes glaze over some of the comments at Ecosophia. It is always a good read, but some commenters enjoy basking in the shadow, and honestly others sound like they’re having trouble holding onto any particular train of thought. Plus I’d have to suggest that reading comprehension is not quite what it once was. I was gobsmacked to read Mr Twain’s dialogue between two early teenagers in the story of Tom Sawyer, if only because they displayed clarity of thought that is quite impressive. And it is not lost on me that Mr Twain intended the book to be a children’s novel that he hoped adults would read. Thanks for mentioning Spartacus as I’d never read anything about his history before and what a character he was. Ah yes, it is a story about how empires would do well to observe the discontent within their own borders before heading off on distant adventures. There are always a few opportunists waiting for their day in the sun. I wonder why Spartacus didn’t head north into central Europe and grow his strength? From a strategic point of view it makes no sense to me that he headed south after successful campaigns. Perhaps there was an element of revenge to his actions and he may originally have been of noble birth and perhaps he harboured a grudge and sought an opportunity? So many questions. Capital punishment of the 6,000 captured though is a mildly obscene act. It makes a statement, sure, but it breeds resentment and is an escalation of dissatisfaction which breeds further resentment and clearly the act was not cost free for the Romans in the long run. You’re having your own Spartacus action over in Boise: Kids These Days: Unruly Goats Graze Hell Across Suburban Boise! I guess so, but sometimes the law can be taken to absurd lengths as appears to be such a case with the historical situation that you outlined. The law is a social construct after all and it represents a set of codes which we agree to live by, and it isn’t something that is used to beat people over the heads without further complications and implications. I read about a very unjust situation the other day: Melbourne conman Antonio Dattilo sentenced to eight years’ jail for plots to bankrupt enemies. From all accounts the costs for people reversing the prior decisions have been prohibitive. Insects are funny creatures in that they do what they want, when they want – and not a moment before or after. I reckon insects come in waves as they go through their annual life cycles. Something will be pollinating the food crops, that’s for sure. Not much gets left uneaten in a garden! Hey, I moved the olive tree today that the naughty wallabies had pulled over and was on something like a forty five degree angle and has been for the past few weeks. It is the largest fruit tree that I have ever moved and it was well over nine foot. 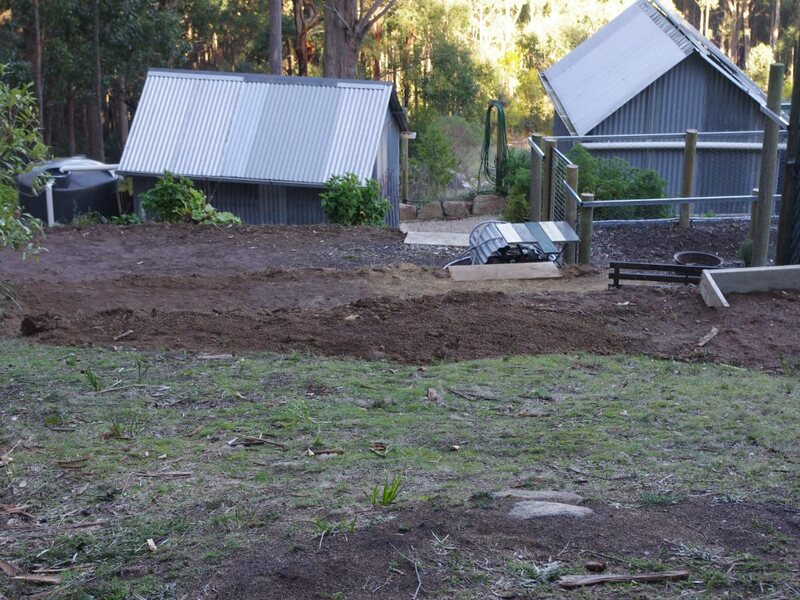 The wallabies appear to have broken the tap root and so at least that made it easier to remove from the soil. I hope it survives. Yummo! I’m totally salivating at the thought of fresh blackberries and blueberries. Enjoy your harvest. Yo, Chris – Could you clarify (explain? Define?) “Any non-centralized machines and devices.” That paragraph seems like something important I should take in. Sooner or later big ag will collapse. For big reasons or lots of small reasons. I was wondering about the huge industro-blueberry farm coming in. I wonder if they will sell any of their crop locally, or just ship it all off … somewhere. We have two local farms. If they sell local, they’re future may not look good. Change. One of my least favorite (or, given the time involved, maybe most favorite) topics. I don’t like it, not much I can do about it, so, as best I can, I deal with it. Aging a year in a week. I think the original Star Trek had a story like that. Trotted out again for ST New Generation. Might have even been an episode on Voyager. The perception of time. Eleanor and I were just talking about that, last night. She said she had three Saturdays, this last week. :-). We talked about how sometimes we feel a bit unmoored, as to what day of the week it is. Time doesn’t drag, but either passes at a normal rate or moves very fast. She had had a rather bad turn. She was watching a program about Pearl Harbor, and suddenly she was a young child again, out for a Sunday drive along the Washington coast. The radio had the news and her father turned right around and headed home. To add a bit of “edge” he had been born in Hawaii. It gave her a bit of a turn. Cont. Cont. Then we talked for a bit about sometimes, historical events, you just know that the world will be a quit different place, from there on out. I saw the headline about the goats in Boise. Well, no surprise. Goats are real escape artists. I had two borrowed goats to help me clear blackberries. One morning I stepped out on my porch, just as 30 of Brother Bob the Bachelor farmers goats charged past my front steps. I quietly closed the door and didn’t even bother to pick up the phone. They were headed toward home. The story about the conman was rather frightening. A true psychopath. Hope the coverage doesn’t give other people ideas. Here, there was a spate of leans on property belonging to law enforcement officers, usually sherifs. It’s complicated as to the reasons. A certain segment seems to think that sherifs, as the highest elected law enforcement local individual, should defend and enforce the US Constitution, as THEY see it. Also, several courts have been overwhelmed by costly “fact finding” requests and motions, brought about by incarcerated convicts. There’s always a “jail house lawyer” or two, about, to help them do that. But, a few laws have been put in place to stem the flow. With the number of European honey bees, in decline, I wonder if there will be a return of larger numbers of native pollinators? That seems to be at work, at least this summer, here. I FINALLY discovered a developing Hubbard squash, this morning. I do wonder a bit about the wisdom of devoting time and space to pumpkins and squash, when I’m getting so little return. But then, I think I fret too much about my garden. The corn hasn’t tasseled, yet. Though it’s over 6′ high. No blooms on the Jerusalem artichoke. Oh, well. I picked a gallon of blackberries, yesterday. 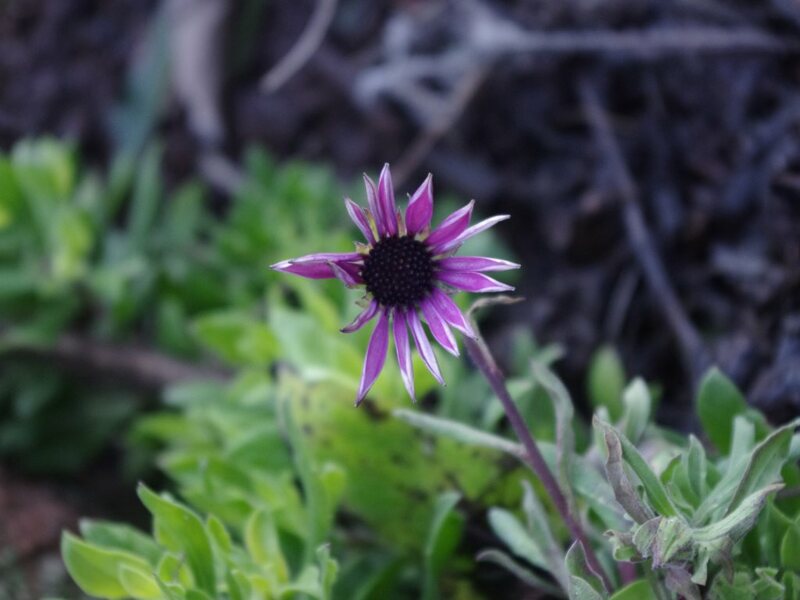 They grow wild around the parking lot, down by The Club. There were quit a few wasps, about. I had probably forgotten, and re-remembered, to tap the end of a cluster. Give it a little bounce. Just to see if anything flies out. That seems to keep me out of trouble. Peak oil Postscript: After a film about a sort of community a la the Amish, but of South America, the film maker was presented to answer a few questions — always highly entertaining. One questioner tried to make the point that said community is hypocritical for rejecting most technologies but for making use of a few relatively high tech developments. What a crack up! The two technology suites that I mentioned in the comment provide similar outcomes, but at different scales, different levels of control and responsibility, and they also use similar but different technology. It is complex, but people rarely understand systems, and so they tend to consider that the because the outcomes are similar, larger centrally delivered services are compatible with say, much smaller scaled home and backyard technologies. The two systems aren’t that compatible. People fixate on that because the outcomes look similar, so clearly we must force the two technologies together, but it doesn’t work so well. A good example is forcing renewable energy sources into a much larger supply grid. The intermittency of the renewable sources is such that they bring with them a level of instability to a system that has long been run to provide reliable base load power in all weather conditions. Perhaps there is an argument that it is not a good idea to force the two systems together and expect them to work the same. But such renewable systems can work well on a much smaller scale where the intermittency of supply can be adjusted to. Society is not setup for such a change, but we’re forcing the issue all the same. Another example comes to mind in the World Made by Hand novels when the fictional town of Union Grove sourced their water from a high level dam which was gravity fed that into the town. That was a lucky story for the fictional town, because water systems are rarely that simple. A lot of mains water systems have pressure reducers, massive pump stations, and high level tanks where the water is pumped uphill and then gravity fed back down again. It all works, but if there are ever any problems, you can’t put water back into that system at any one point and expect it to work. A good example is water that you’ve collected from your roof – no matter how large the water tank and your storage is, you can’t add your collected water into the much larger water supply system. The two systems are basically incompatible, but nobody seems to notice or even comment upon it, because the outcomes i.e. water at the tap are the same, and so people think they’re the same. Mr Greer talks about the lost opportunities of the 70’s appropriate tech movement, but things still ticked along there in the renewable systems during the intervening years, but I reckon the divergence between the two technologies has become too great to be able to integrate them in any meaningful way. And yet, people look to that appropriate tech stuff as if it is an option on a grand scale which it was never intended to do. Dunno. I hope my explanation makes some sort of sense? It appears that Chaos has visited your domicile and has now moved on to more fertile pastures. I do hope that things settle down and that your maintenance guy gets his gig back. Yes, inner directed, that makes a lot of sense – it is a remarkably common thing. The mention of blueberries up your way quite surprised me because we’ve had a few problems down this way with frozen berries (which I hope I’m not consuming): Frozen berries linked to hepatitis A cases originally cleared by company testing. I’d have to suggest that human manure is a good fertiliser, but perhaps it might not be a bad idea to compost it for a few months first before using possibly on the soil surface. Well, that’s probably how the year in a week meme got into my head. I quite like Star Trek, but just for the sheer fantasy of it all. Who knows why the Vulcans would have stuck around to help us humans? It seems like a big call. I did enjoy that Next Gen film though where they first met the Vulcan’s. The thing I don’t understand with Star Trek films is why don’t they just set about telling a good story – why all the Earth is in peril and let’s blow up the planet Vulcan business? Apparently the conman will be deported after his stint, but the story itself was a real worry. We’ve taken some proactive actions based on that very remote possibility. And your thoughts on the matter were the same as mine about jailhouse lawyer. We have one such down this way who has been declared a vexatious litigant for life: Hoddle Street killer Julian Knight declared vexatious litigant for life. I used to live near to Hoddle Street and the stench of history stuck to the area for quite a while. Exactly, we don’t live in a bubble, and if feed is available, then something will come along to eat it. I suspect that you are correct about the native bees and wasps. You got me curious as to when the corn here formed their tassels and it was about the end of January which would only be a week or two back if I were in your part of the world. I reckon summer will have a bit longer to run for you yet! Hey, the Jerusalem artichokes failed to set flowers at all here last year so I wouldn’t worry about them. They still produce copious tubers, that’s for sure. You’re smarter than I about the wasps because I once tried to pick a wild apple that was covered in wasps. Fortunately none of them stung me, but it was a hard won lesson that’s for sure. Interestingly the wasps avoid the blackberries down here. Thanks for your kind wishes regarding our move and Michael’s recovery. Move is mostly done and we even got internet installed yesterday. Today I still have to go back and finish cleaning the old house and the new owner will do a walk through at noon. We are able to keep the pigs and bees there and a few things in one of the buildings as our agreement was we could stay until the end of August but we will be very happy to only have to keep up with one property now. Things are quite the mess here at the new place but basics are set up. Our youngest daughter and boyfriend stayed over the last two nights. It was only going to be one night but he was on call for his job. He is a senior IT engineer for Cars.com and they are having a major problem with their website. He’s able to work remotely from almost anywhere. By early evening it was apparent that he was going to be working through the night so they just stayed here. We have no guest room set up so it was a couch and aero bed for them. Now on to Michael. The evening before we moved Michael who was doing very well crashed and ended up in ICU on a ventilator. Apparently he threw a blood clot and they thought this was it be it seemed it dissolved by itself. At first my sister and I were preparing to make a decision as to whether or not to take away the ventilator but after consultation decided to wait for 24 hours. He’s now off the ventilator but still in ICU. My one sister (his other guardian) and other family members have spent the night with him for the last six nights. After cleaning this morning I’m going up to relieve my one sister who hasn’t been home to Chicago for a week. I am really hoping I don’t have to stay but it is a real possibility. Other sisters have work tomorrow. When all this happened his lungs filled with fluid and he has to be encouraged now to keep coughing up stuff and the ICU nurses can’t be with him all the time. My sister has been very happy with his care though. On a good note our new property is lovely and a hummingbird was at our kitchen window when we were eating dinner so have to get our feeder up. Salve and Leo are loving it too but are a bit confused. Hoping to catch up on all the comments soon. Yo, Chris – Thanks for the explaination. I’ll have to ponder it, awhile. Two systems may produce the same result, but not necessarily “play nice” with each other? “Food bourn illnesses.” Seems like we’re always having an outbreak and recall of something or other, here. Hmmm. Back in the “old days” when human manure was spread on crops, I don’t remember anything about composting anywhere in the process. A stray thought: When the Night Soil Men went about collecting, did they have a “street cry?” “Bring out your poo?” :-). Another random thought: Does your digester produce heat? Thanks for the info on the Jerusalem artichokes. I’ll have to poke around the Net and see why they don’t flower, from time to time. Darn! I was looking forward to seeing the flowers. Cont. Cont. I got a little book from the library called “Pollination with Mason Bees: A Gardener’s Guide to Managing Mason Bees for Fruit Production.” (Dogterom, 2002). I’ve got bits and pieces from the Master Gardener Dude and read a few articles on the Net. This may provide more detail. Which was found in 1998. I’d never heard of it. Hmmm. We were talking about princesses. I was looking at the photos for an upcoming auction and noticed a wall plaque. “We can’t all be princesses, someone has to clap when I go by.” :-). Yup. Twits. I’m reading “Atlas of a Lost World: Travels in Ice Age America.” (Childs, 2018). It’s about the peopling of the “new” world. I had forgotten that I had read “House of Rain” by the same author. Which I quit enjoyed. That was about the first peoples in the American SW.
Any-who. He talks a bit about why people might move about. Migrate. Explore. Turns out, there’s a dopamine receptor in our brains called D4 that is correlated with restless behavior and what is know as “novelty-seeking” – “the kind of people who are reckless or adventurous, in need of something new.” A genetic study of two thousand prehistoric people (1,000 to 30,000 years old) discovered that people who had more prevalent D4 migrated more. People with less, stayed put. Among Native Americans, the further you get from the land bridge between Alaska and Siberia, the more D4 you will find. People closest to the land bridge have D4 that shows in 32% of the samples. People in Central America, have 42%. South America? 69%. Interesting.